Q: The British Prime Minister said in Japan that China should do more to pressure the DPRK in order to resolve the DPRK nuclear issue. What is your comment? A: People say all kinds of things whenever the situation on the Korean Peninsula becomes tense. What you just mentioned about China being asked to apply more pressure is one of them, a very typical and representative kind. I want to stress that China approaches the Korean Peninsula issue while bearing in mind the goal of realizing denuclearization of the Peninsula, safeguarding the international non-proliferation regime, and maintaining peace and stability on the Peninsula. We have been comprehensively implementing relevant Security Council resolutions in their entirety, upholding an objective and unbiased position, and making positive and unremitting efforts as we should. In the meantime, I would like to ask other relevant parties as they ask China to exert more pressure, are they comprehensively, completely and faithfully implementing relevant resolutions of the UN Security Council without holding back anything? Or are they consciously being selective in implementing the resolutions, such as overemphasis on pressure and sanctions and total overlook of calls for dialogue and peace talks? We have seen some with their own axe to grind, some pointing fingers while stabbing in your back, and some muddying the water to seek profits, or even risking getting burnt to gain what they want. They are the loudest when it comes to sanctions, but nowhere to be found when it comes to making efforts to promote peace talks. They want nothing to do with responsibility. They just want to sit by and wait for the outcomes delivered to their faces. No responsible country will have that kind of attitude or do things in that way. In China, we say "you reap what you sow" and "those who tied the knots are responsible for untying it". We have said many times that the essence of the Peninsula issue is the security issue. The key to peacefully resolving the Peninsula issue is in hands of the directly concerned parties which are the DPRK and the US, the DPRK and the ROK. They hold the key, but each time they take one step forward towards unlocking the door, they backtrack three steps, showing no willingness to open the door. So, what's the use of others worrying and agitating? Therefore, we hope that under the current circumstance, the directly concerned parties will be brave to take up their own responsibility, play their due role, truly think about their people and regional peace and stability, judge reasonably and make the right choices. Today, the UN Security Council issued a presidential statement which reflects the consensus of the international community on the DPRK's missile launching activities. It asks the DPRK to immediately halt all missile launches and calls on all member states to observe the Security Council resolutions on sanctioning the DPRK. It also recommits the Security Council to resolving the DPRK nuclear issue through peaceful, diplomatic and political means. I must point out once again that the relevant resolutions of the Security Council have two parts. The first is to take effective measures to curb the DPRK's nuclear and missile development. The other is to support the Six-Party Talks and stress the importance of resolving the Peninsula issue through peaceful, political and diplomatic means and avoid words and actions that may escalate tensions. These two parts are equally important, and neither of them shall be overemphasized or overlooked. We hope that all parties could demonstrate their sense of responsibility, implement the Security Council resolutions in a comprehensive and thorough way, and work together to draw the Peninsula issue back to the right track of peaceful settlement through peace talks. Follow-up: you said some countries are irresponsible. What do you mean by that? Is the UK one of them? A: Just look around and think with an open and unbiased mind, and the answer will present itself. Like I said yesterday, relevant parties should consider several questions. What have they done for the peaceful settlement of the Peninsula issue? Do they believe that sanctions alone have worked, regardless of how hard they have pushed for them? If this issue could be worked out by simply plying pressure and pursuing sanctions, then how did we get stuck in this vicious cycle where the situation simply gets worse and worse? Cannot we all smell the strong smell of "gunpowder" on the Korean Peninsula? Isn't it time for all sides to cool down and do some serious thinking? For me, I would like to suggest that relevant parties revisit the September 19 Joint Declaration. Just read it and ponder on it. Who in the final analysis should be the principal responsible party or parties that led the Peninsula issue into a vicious spiral of nuclear and missile development vis-a-vis sanctions and pressure? It takes two to have a quarrel. Only when all parties stay faithfully true to the reason that set us all on this path, which is to achieve denuclearization of the Peninsula and safeguard its peace and stability, can we make positive steps on the track of resuming dialogues and consultations with the least delay possible. Q: You just talked about China's position. 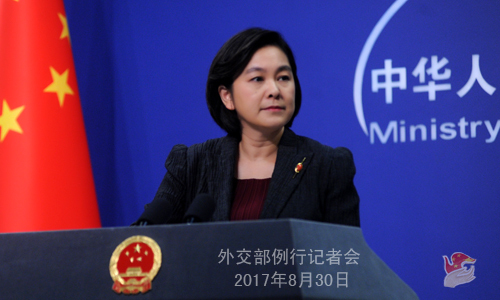 If other countries seek stronger economic sanctions against the DPRK, how will China respond? A: We believe that all sanction measures against the DPRK shall fall within the framework of the UN Security Council and follow the resolutions of the Security Council resolutions. Whether there will be more measures shall be decided by the Security Council upon consensus. Meanwhile, we oppose any country using unilateral sanctions, or evoking its domestic laws to impose "long-arm jurisdiction". I just said that the Security Council resolutions include two equally important parts, neither of which shall be overemphasized or overlooked. We hope that all relevant parties could earnestly, comprehensively and thoroughly implement the existing Security Council resolutions. Q: After the latest Security Council meeting, we noticed similar statements from the Chinese and Russian ambassadors. So how close are China and Russia on communication and coordination regarding the DPRK nuclear issue? Do you share the absolutely same goal on resolving this issue? How does China view Russia's increasing political or military presence in the region? At the BRICS Summit in Xiamen, if President Xi Jinping talks with President Putin about this issue, will any new consensus be reached? A: I cannot really quantify the closeness of China and Russia on cooperating to deal with the Peninsula nuclear issue. China and Russia are Comprehensive Strategic Partners for Coordination, and such partnership operates at a very high level. Therefore, the two sides remain in close coordination and cooperation on both bilateral affairs and major international and regional matters. As for whether China and Russia share the same goal, when it comes to realizing denuclearization of the Peninsula, maintaining its peace and stability, and peacefully resolving the issue through diplomatic means, we are on the same page. Actually, the five permanent members of the Security Council and the international community are on the same page with regard to this general goal. What makes some countries differ from each other at the current stage is the specific ways to achieve the goal. Russia is a very important neighbor to China and one of the five permanent members of the Security Council. Just like China, Russia have significant influence and impact on persevering world peace and stability and promoting peaceful solution of regional hotspot issue. China would like to further enhance coordination and cooperation with Russia to jointly safeguard peace and stability of the region and beyond. As for what kind of new consensus will emerge on the Peninsula issue when President Xi Jinping meets with President Putin during the BRICS Summit in Xiamen, I cannot prejudge that. But we believe the two sides will exchange views thoroughly on international and regional issues of mutual interest. Q: On August 29, the International Atomic Energy Agency (IAEA) inaugurated its Low Enriched Uranium (LEU) Bank in Astana, Kazakhstan. What is your comment? A: We are glad to hear that the LEU Bank of the IAEA was officially launched yesterday in Kazakhstan. The LEU Bank will make positive contributions to lowering the global nuclear proliferation risks and promoting international cooperation in the peaceful use of nuclear energy. 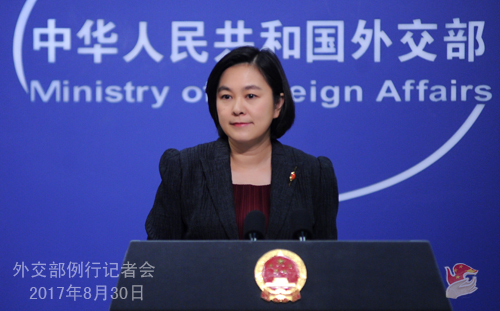 China highly commends the efforts made by the host country Kazakhstan. China always supports the establishment of the LEU Bank. We signed the cross-border transportation agreement of the LEU Bank with the IAEA in April. 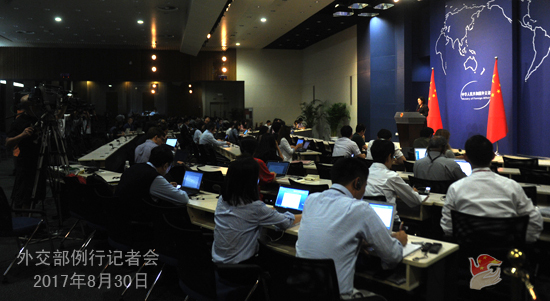 China will earnestly implement that and work with all parties to ensure the smooth operation of the LEU Bank.